That is such a pretty looking bread Harini. I had baked this some time back but did not know of its origin or significance. Very interesting and beautiful bread. This xmas bread looks very catchy with a beautiful shape. A very pretty centerpiece bread. Wow ! That's a. very pretty looking bread , I wouldn't feel like eating it . Yes the step by step pics are a great help , though I wonder when will I have the courage to bake it. It truly is a centrepiece worth all the attention. It is so pretty I couldn't take my eyes off of it. Very nicely done! Amazing Harini, that Christmas bread has turned out awesome..must say it looks so pretty that I wouldn't want to slice it..:)..such a wonderful find. That is a showstopping bread -- looks so pretty. You have done an excellent job in shaping it Harini. Awesome!! 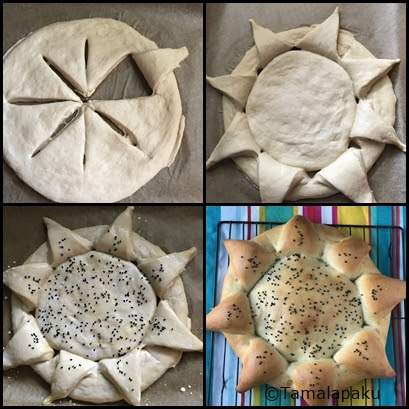 The sunflower shaped Bulgarian bread is looking fabulous . Must have tasted amazing. Perfectly shaped and an awesome bake.. Perfect pick!! How beautifully shaped and this bread would make for a lovely centerpiece. Wonderful bake Harini!